It’s a sad fact that the more frugal and flavorful cuts of chicken, such as legs and thighs are often overlooked by the ever popular breast. I’m here to say, however that you should be giving these cuts a try! Not only do they save you money, but they’re also full of flavor. Plus, you can use the bones to make your own rich and nutrient dense chicken broth, saving you even more money. If you’re one to reach for chicken breasts time after time, then I would encourage you to give legs (or thighs or wings) a chance! I think you will be pleasantly surprised. Plus, you can stock up when they are on sale for really cheap (such as .49/lb) and freeze them for later. It’s really a win/win. 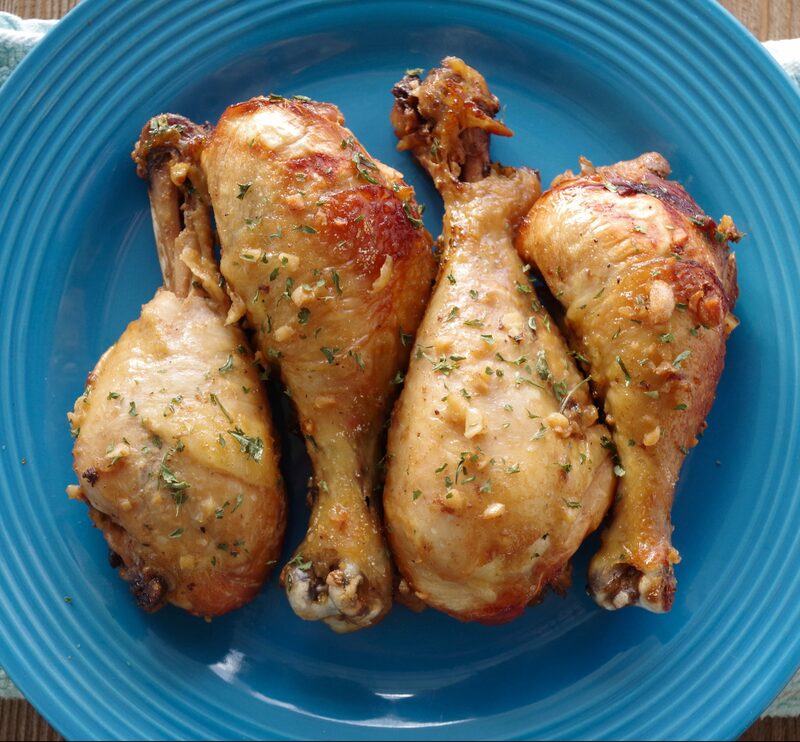 I know you’re going to love this simple and frugal recipe for Slow Cooker Honey Garlic Chicken Legs. If you don’t have legs on hand you can definitely substitute any cut of chicken that you might have. For the most flavor, I normally pull the meat from the bone before serving and pour several tablespoons of the flavorful juices on top. Also, if you’re on the look out for more delicious recipes like this one then be sure to check out my Ham & Swiss Sliders, Instant Pot Zuppa Toscana Soup and Flourless Peanut Butter Chocolate Chip Cookies. Enjoy! Place chicken legs in slow cooker. Mix all other ingredients in small bowl. Pour mixture over chicken legs. Cook on high 4 hours/low 6-8 hours or until chicken is cooked through. Step 1: Place chicken legs in slow cooker. Step 2: Mix all other ingredients in small bowl. Step 3: Pour mixture over chicken legs. Step 4: Cook on high 4 hours/low 6-8 hours or until chicken is cooked through. Making this today - I bought a large package of chicken drumsticks and thighs and want to cook them all today so we can heat them up during the week for easy and quick meals. I basically tripled the recipe (I have a large crock-pot). I found that I was out of onion powder - so I finely diced up yellow onion to use instead, and I didn't have enough fresh garlic so I used what I have. That's a lot of soy sauce, I used low sodium and added less than called for (I'm concerned about sodium intake) Hopefully turns out great! Hey y'all from Alabama! I made this for my crew and boy let me tell you what.....I'm glad we didn't have any guests and I made a whole big value size legs, thighs and wings because between me, my husband, my father in law and my momma they were GONE! I MEAN GONE! SIDE NOTE: I like a little heat, so I used a little red pepper in my second crock pot so we had some with a kick. Love this and definitely making it again! Will frozen breasts do okay with the same ammount of time? Technically, you aren't supposed to use frozen meat in your slow cooker, but if they were thawed, then yes they would work as well. The chicken legs were so juicy and full of flavour. I recommend if you're making these that half way through the cook time to flip the legs over if possible so both sides get the sauce on them. I didnt and they were still delicious but would definitely do that step next time! Do I need to take the skin off before cooking? Will it be kinda crunchy when cooked? That's a personal preference. It will be a little crunchy, but not much. I halved the recipe, opted not to use garlic powder, and used onions instead of onion powder. This turned out wonderful! We had it with rice. My husband also loved it! Do you add any water or chicken broth in the Crock-Pot or just the mixture alone? Can you use Bragg Liquid Aminos in place of soy sauce? I tried this recipe and ended up with a dried out burnt mess! Is it possible with your crock pot or make sure the cover is on properly . This happened to me before and every recipe got burned . Ì exchanged my crock pot at wal mart ( still had receipt ) and all was fine after that . Turned out AMAZING & thank you!!! I added small cut potatoes and small cut carrots as out of the house all day & wanted a ready meal. Came out GREAT!!!! Mine is also oval and I've have had no problems with it burning since the chicken releases so much juice, but if you're worried you could always add chicken broth. Thank you for your reply so quickly. I have the legs in the crock pot now. I am at the 1 hour mark or so on high and they are looking ok. I plan to cut up some baby carrots in a few hours and add them. I will add a bit of chicken broth if needed.